With a VoIP gateway in place and acting as a bridge, you can then create backup routes to ensure that each call is successful. This also provides you with an opportunity to create a least-cost-routing scenario that then directs calls over the least expensive network - sending it through the PSTN, GSM or VoIP depending on the call destination. 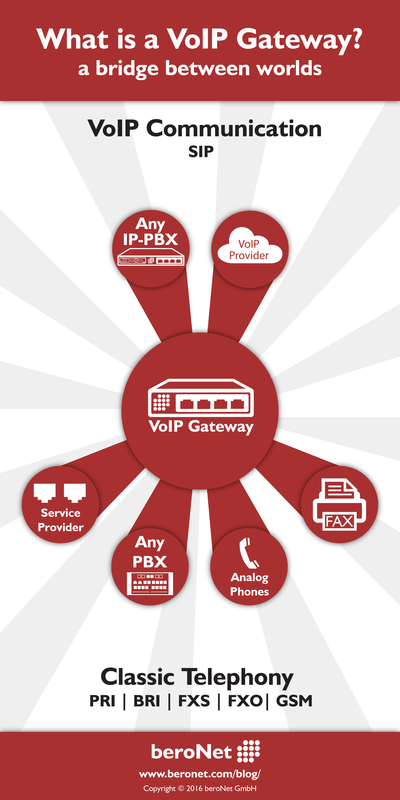 Some newer VoIP gateways have additional functionalities that allow them to act as more than a bridge. For example, beroNet Gateways can be enhanced through the use of Apps. Such apps can then transform the device into a Survival Branch Appliance - enabling the gateway to act as a backup to hosted or off-site IP-PBX systems.